Add any saying or quote to this colorful Personalized Any Message Can Wrap and make it a great gift idea for Father’s Day, Mother’s Day, Grandparents Day, Birthdays or just because. Each Can Wrap keeps your favorite beverages cold while looking cool at the same time. Give a Personalized Can Wrap with your special message to anyone as a unique gift idea. Your Personalized Any Message Can Wrap measures 4" x 9 1/2" with velcro closure around your beverage bottle or can. Personalized can & bottle holder includes FREE Personalization! Personalize your Message Can Wrap with any two line custom message. Additional Details A Personalized Can Cooler or Personalized Can Wrap makes a great Personalized Father’s Day Gift Idea. 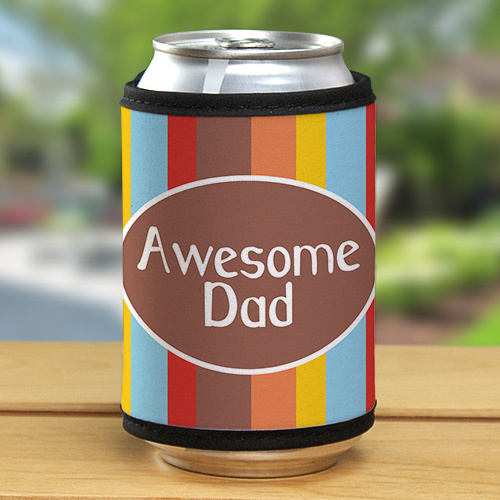 Let dad keep his drink cold on warm summer days when you present him with this unique Can Wrap. Dad will also enjoy our Block Message Personalized Can Wrap and our BBQ Grill & Chill Can Wrap as well.